Yet another amazing book by Sophie Kinsella! Honestly, there's nothing not to like. I've Got Your Number is hands down my favorite book by Sophie Kinsella and now one of my favorite chick lits too! Kinsella's books introduced me to the Chick Lit genre so when I received an ARC of this book, I was literally jumping in joy! Poppy Wyatt has lost the one thing she shouldn't have - her engagement ring. It's her fiance's family heirloom passed down for generations and it would be a very bad thing to have lost it, especially since her in-laws already don't like her very much. To make matters worse, while she's looking for the ring, she gets mugged! Now she's ringless and phoneless and has basically given up all hope when by chance, she finds a phone (not hers) thrown in the trash. Obviously, unable to resist she picks up it up..and that's when the story begins. After Rebecca Bloomwood, I think Poppy's the funniest among all of Kinsella's characters. The frequent references to Poirot had me laughing to myself so many times! This one is a little different from Kinsella's other books, she focuses a bit more on the romance than she usually does. Poppy Wyatt's strong but she doesn't realize it. She's special but she doesn't see it. Her fiance (His name is Magnus) belongs to family of brainiacs and Poppy doesn't fit in, she feels like she can't keep up with them and lies to feel like an equal. She's got a lot of insecurities and a compulsive need to be nice so people like her. Ah seriously, Poppy's a character you'll appreciate and learn to love ladies!There's one scene in the woods.. God, I got butterflies in my stomach! All I can say is, Chick Lit lovers and Kinsella fans, you won't be disappointed! I've Got Your Number is utterly charming, keeps you laughing and entertained while making you feel all warm and gooey inside! In my opinion, this book is made for Hollywood! This sounds adorable. I've not read this genre, but it just sounds like too good a plot to ignore. This sounds great. I do have to ask: is much of the book in text format or e-mails? I have enjoyed her books in the past and would like to read this one but have tired of other authors using this technique in their writing. Thanks for the review! It's a normal book, parts of it include emails/texts but just very little.. most of it is a normal chick lit book. I loved it! Give it a shot :) There's a book called Goodnight Tweetheart which completely takes place in tweets. u might like that one if you're into that kind of writing! I haven't read any of the shopaholic books but I have read Can You Keep a Secret? and her other stand alone books and loved them! One of my favourite authors - an inspiration! Love this review Anjana, and I'm glad I stopped by! 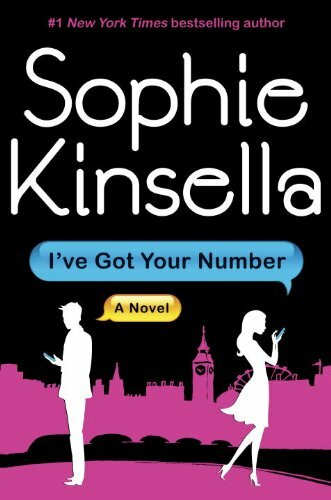 OMG, I have always been a fan of Sophie Kinsella and I have been looking forward to reading this one! Remember Me? is my favorite of 'em all and I love how things go from normal to worse and worst in her books; she's hilarious! =D Great review!